During Comic-Con, the collectible arthouse Mondo unveiled some awesome posters for Guardians of the Galaxy, not to mention announcing their foray into collectible toys with figures for The Iron Giant and more. Now Mondo is back to their regularly scheduled programming (via Badass Digest) with great artwork for two of the most revered cult classic horror films. 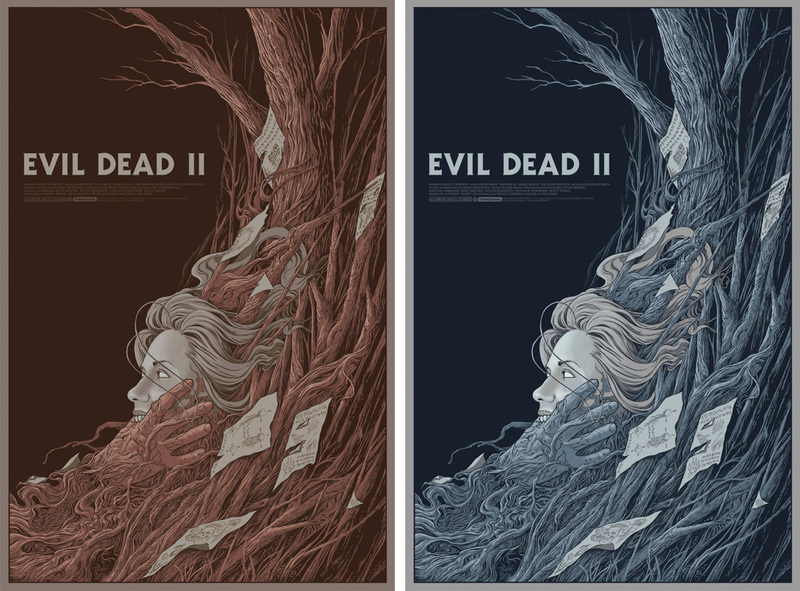 Evil Dead II is given a stylish poster by Randy Ortiz while Army of Darkness is given two different prints by Tom Whalen and Richey Beckett. 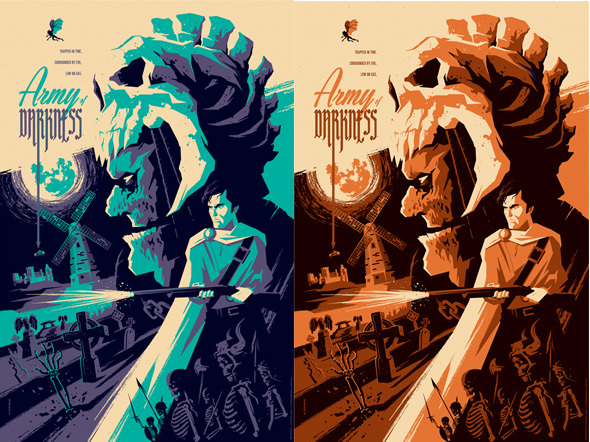 Technically there's six posters since each has a variant to go along with it, but if you like Mondo, you know the drill. My favorite is probably Tom Whalen's, but I'm a sucker for his illustration style. 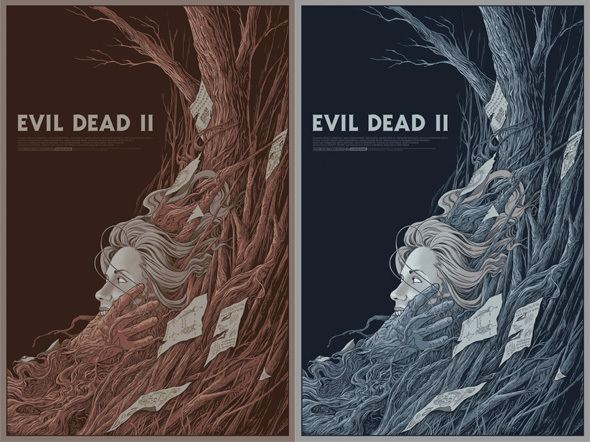 Randy Ortiz's Evil Dead II posters are 24×36 screenprints with a regular edition of 225 for $45 and a variant edition of 100 for $65. 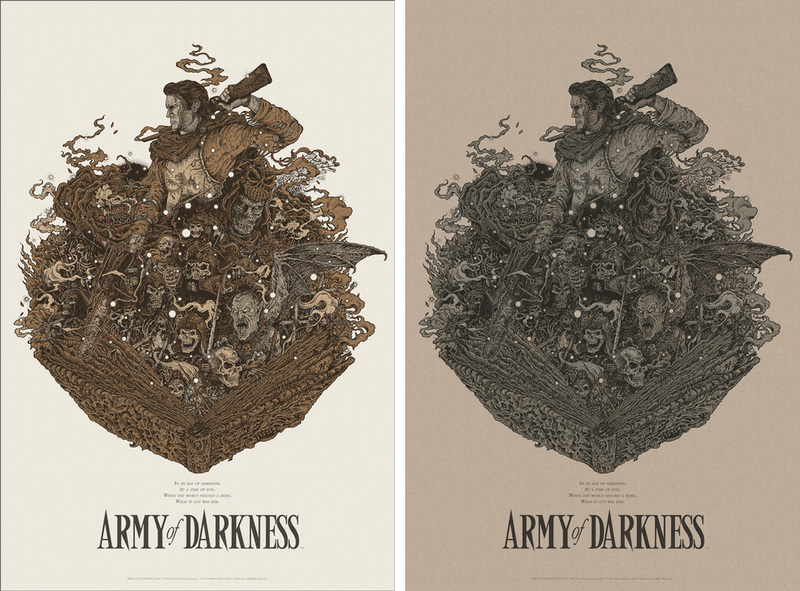 Richey Beckett's Army of Darkness posters are 24×36 screenprints with a regular edition of 275 for $45 and a variant edition of 125 for $65. 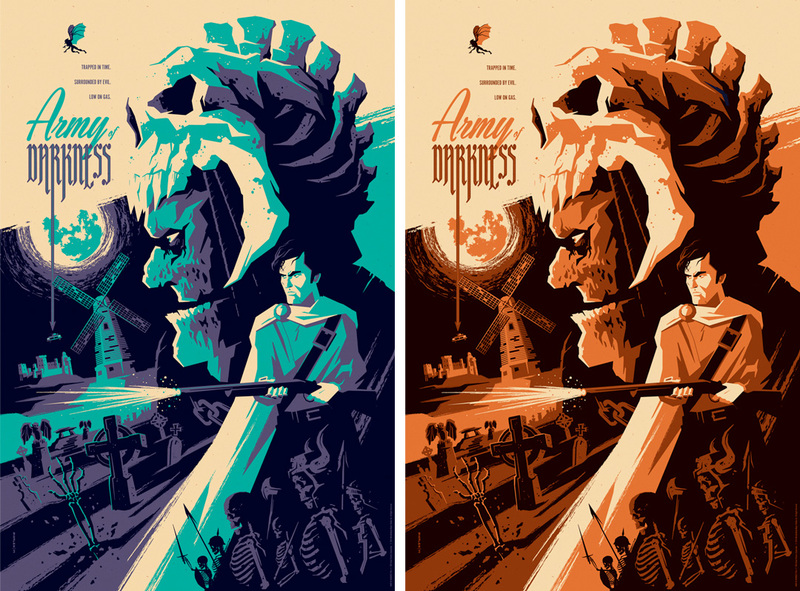 And Tom Whalen's Army of Darkness posters are 24×36 screenprints with a regular edition of 275 for $45 and a variant edition of 125 for $65. All posters go on sale at a random time tomorrow, and as always, stay tuned to @MondoNews on Twitter to find out exactly when to buy them. The first poster for Army of Darkness...I want the brown one...now. Woah. They are all kickass. Love them all. The first ARMY OF DARKNESS one is my favorite. What's the wording on the AOD posters? "Sacrifice - An Army of Darkness Micro Movie" “Sacrifice” is a fan made micro movie based on the comedy / horror movie, Army of Darkness (1993). The objective of this micro movie was to re-edit ED / AoD into a romantic yet tragic love story where Ash has to make a decision, save himself, or sacrifice himself to save another that would doom him to stay in the Dark Ages, forever.. If you recall from Evil Dead 2, Ash’s girlfriend is possessed by a demon so he had to kill her. That’s an incredibly tragic and sad event. I wanted to make a short movie about that, focusing on the romantic aspect of the story. This is that movie.